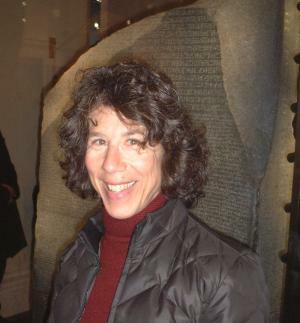 Biography: Barbara Tversky is a professor of psychology at Stanford. She studied cognitive psychology at the University of Michigan and taught at Hebrew University in Jerusalem before coming to Stanford. She started working on visual and spatial cognition early on because the prevailing view was that that visual and spatial things could all be explained by words or propositions. This led to studying a variety of topics, picture memory, cognitive maps, categorization, eye witness memory, spatial thinking and reasoning, diagrammatic reasoning, design, spatial language, and visual and spatial representations on paper instead of in the mind. In the first of a series of interviews, Barbara Tversky, Professor at Stanford University, gives her memories of the COSIT '93 conference, and some background to the paper she presented at this conference (now one of the most often cited COSIT papers). You can download a copy of this paper using the link on the right of this page. Tversky, B. (1993) Cognitive Maps, Cognitive Collages, and Spatial Mental Models. In Frank, A.U. and Campari, I. (Eds) COSIT'93, Lecture Notes in Computer Science 716, 14-24. Springer, Berlin. Why did you submit this paper to COSIT'93? Barbara Tversky: The COSIT announcement arrived by email, I had never heard of the group, but I was excited to learn that there was an entire group, interdisciplinary at that, already working on spatial information processing. That meeting--on Elbe--was especially broad, people from anthropology, architecture, HCI, linguistics, psychology,and of course what I was to learn was the core, geography and computer science. It was equally diverse internationally, I felt very much an outsider but being an outsider means you listen and learn. Can you summarize the key ideas in your COSIT'93 paper? BT: I thought an appropriate introduction would be an integrative overview of some of our work on spatial thinking,and that's what I submitted. Part of the paper contains a review of our work on spatial mental models from description and on survey and route perspectives in spatial descriptions. The other part, the part that seems to have gotten picked up, reviews systematic errors in people's memory for and judgement on maps and environments. The general argument is that the information people have about environments and maps is piecemeal and ad hoc, culled for a particular question, about distance, direction, whatever. As such, it is multimodal, memory for journeys, for maps, for verbal descriptions, and more. As a consequence, it may be inconsistent--that is, not feasible in a 2-D or 3-D space. Rather than "cognitive map," a better metaphor for people's mental representations of environments and maps seemed to be "cognitive collage." What are the most important features of the COSIT conference series for you? BT: The COSIT community proved to welcome not just other disciplines but other people, not just established researchers, but also beginning ones, so the mix of people and topics is always changing, part of the appeal and the excitement. I feel grateful for the welcome I received, and now count researchers in the COSIT community as good friends, good colleagues, and excellent inspirations.